Official English Verision is here. A happy new year at the opening of the 754th year of Nichiren Shoshu. 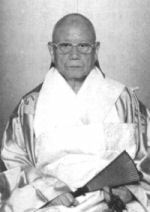 As informed, I have transferred the importance of Nichiren Shoshu Buddhism since Nichiren Daishonin and Nikko Shonin to Nichinyo Hayase, who was at the position of gakuto on December 12th, with the inheritance of one person to one person. After that, Nichinyo was inaugurated as the 68th High Priest and the chief priest of the head temple of Taiseki-ji, following the provided procedures, and I have stepped down from the geiza throne on December 15th in order to refresh the feeling of the popular mind. 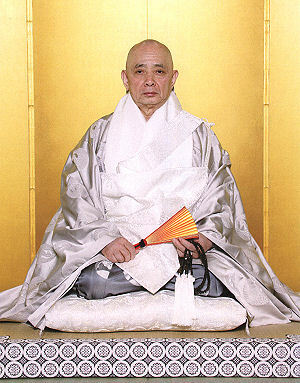 Since personality, learning and discernment of His Highness are outstanding, I hope that all priests and believers of Nichiren Shoshu in the world adore the new leader and follow the instructions to protect and prosper Nichiren Shoshu. It has been great pleasure for me to manage very important ceremonies during the 27 years as the 67th High Priest: the 700th anniversary of Nichiren Daishonin in 1981, the 650th anniversary of Nikko Shonin and Nichimoku Shonin in 1982, and the 750th anniversary of Nichiren Shoshu Buddhism in 2002. And the maintenances of the head temple, the establishment of the college for young priests, the action to protect the true tradition of the religion, and the development strong cooperation between the priests and believers have been achieved owing to the great help of the true Buddha and the kind supports of the priests and believers in the world. I would like to express sincere gratitude. I will serve the religion as mush as possible, forgetting the old body, because the shakubuku propagation is urgent when world-wide disasters often take places and the moral decay is extreme. I hope again the forward movements of the cooperative priests and believers, heading for the 750th anniversary of "Rissho Ankoku Ron" in 2009. J/E Translation by K. Shibuya (not official version).